Ever since our first summer in our house, I had been wanting to get a really good fan for our living room. Even though we have central air conditioning, the living room gets very warm on 90 degree days. I mean, it gets very uncomfortable to even sit in there for more than a couple of minutes. I think it has something to do with the way our house faces the hot afternoon sun. 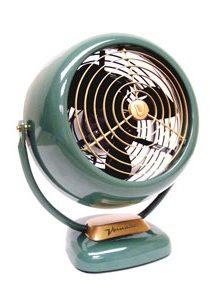 Anyway, I heard a while back that Vornado had released some vintage-style fans - replicas of their originals from 50-60 years ago. So, I headed over to their website and found one that I thought would be perfect. It's their classic green, air circulating fan. You know, the kind your grandparents always had running during the summer (at least mine always did). They are kind of pricey, but well worth it! Now, our living room will be a little more comfortable (and stylish) this summer! Just a heads up that I bought mine two years ago and it is a PAIN to clean. I have to say I do like the easy clean options on newer fans, although nothing is as cool as this fan! !